I feel like I have stumbled upon some new found energy, most of it probably has to do with the fact that I am now about 3 weeks into my second trimester, yes folks, I’m pregnant!! We are expecting a new addition July 1st. This is our first so everything in this pregnancy is new to me, especially the extreme lack of energy. The past few months I haven’t made anything a priority except sleeping, showering, and making it to work, reasonably on time. But slowly within the past few weeks I have realized that I am capable of doing more each day. It’s a pretty exciting feeling! At the same time though suddenly I am coming up with lists in my head of everything I need to accomplish before my energy disappears again. I know a lot of people make a list of 30 things to do before turning 30, a “30 before 30” list if you will. But I’ll be 30 in 3 months so it’s a little late for that, but in 5 months I’ll have a baby and I feel like turning 30 isn’t as much of a life’s milestone/life changer as compared to having a baby, in the way of life adjustments, especially in regards to free time. Some tell me fun ends once the baby arrives…cough cough…Nicole! Now I know that isn’t the case, but I do understand that my personal time for hobbies will greatly decrease which is a shame with all that time off of work. Too bad I can’t have pre-maternity leave since maternity leave will basically consist of feeding and sleeping. My two biggest things that I have already checked off my list were a fabulous wine tasting weekend and a trip to Europe. 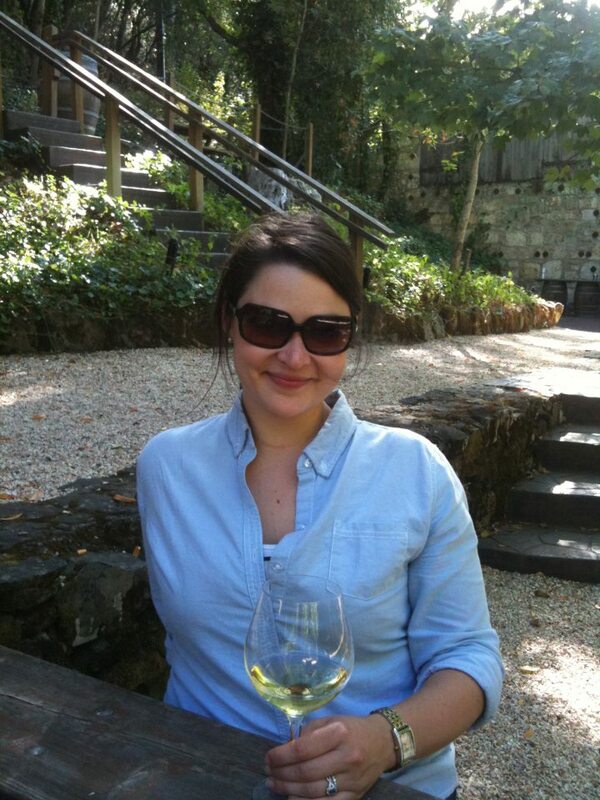 We went to Sonoma in September for our 1 year anniversary and it was absolutely wonderful. I didn’t post about it, but it was the perfect weekend getaway. We flew into Oakland, rented a car, and drove up. I have been blessed with an incredibly generous family that lent us their condo. 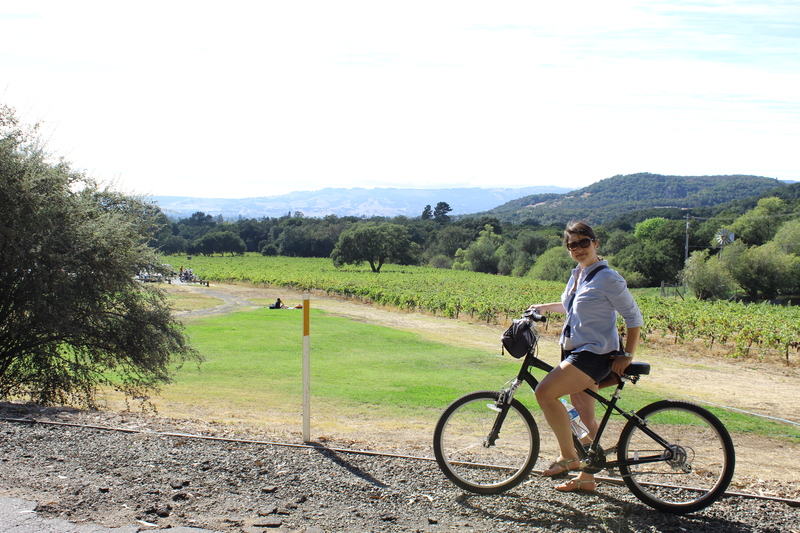 We rented bikes and rode from vineyard to vineyard in the sun. Oh, and the best part was that just as we started out we found $100 cash in the park. Totally random, there was no one around, so we used it to buy our wine along with over priced fruit and cheese plates at the wineries, definitely lived it up like rock stars! But I digress. It must just be my longing for wine talking! Long story short, I got my wine tasting weekend in! And it was fabulous! As was Europe! The room is so small, it was hard to get a good picture, so I opted to take 4 and post them together, hopefully it makes sense. As of now, this room is part laundry room, part storage, part project room, part give away pile room, part Jesse’s closet, part guess room, and experimental paint color room. I’ve sampled many colors, and after all the sampling, I think we have decided to go with the same paint color that is our room, which is a warm cream color. Obviously there is a LOT to do in this room, and will definitely need to be done in stages! I feel like at this point I have 20 solid to-do items, I have about 23 weeks left, and I know that they won’t all be productive, so the remainder are just personal reminders for my last few childless months. 30. Enjoy growing a baby and mentally/emotionally/physically prepare ourselves for a baby! Good list Em. I especially like #22 because at some point, much later, it will become difficult! Congrats on the pregnancy! It is a trip in it of itself! Congrats on your pregnancy! Just found your blog this morning, what a fun time to follow someone(s) new. What a beautiful blog and I completely agree that things are Better Remade! Congratulations on your pregnancy! As I’m writing this, I am 17 weeks myself and I know exactly what you mean about the fatigue and lack of energy. Hmm, your “30 before baby” list made me think. I only have about 2 months until I turn 30 myself, so some time ago (in the dark and queasy months of the first trimester) I decided to take it easy and not make any grandiose plans for the big 3-0. But, given that I have until the end of July until the baby is due, I might make a mini-list myself – not 30 things to do, but maybe 8 or 10. I’m marveling at the similarities between us!